Chancellor Philip Hammond unveiled his Budget promising to invest in technology, provide further funding for devolved authorities, business and the NHS and to continue restoring the public finances. :: The Chancellor is setting aside £3billion over the next two years for Brexit preparations and stands ready to allocate further sums if and when needed. :: The OBR expects debt to peak this year and then gradually fall as a share of GDP, Mr Hammond said this was a "turning point in our recovery". :: Investment of £500million in a range of technological initiatives ranging from artificial intelligence, to 5G and full fibre broadband. :: Support for electric vehicles through the establishment of a new £400 million charging infrastructure fund, an extra £100million in plug-in-car grant, and £40million for charging R&D. 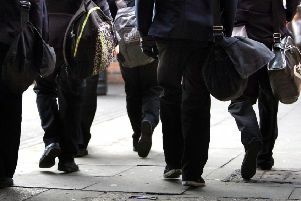 :: Some £40 million will be made available to train maths teachers and the number of trained computer science teachers will be tripled to 12,000.
:: New £1.7 billion Transforming Cities Fund to give elected mayors the "fire power" to deliver local priorities. Decisions taken in this Budget also mean £2billion more for the Scottish Government, £1.2 billion more for the Welsh Government and over £650 million more for a Northern Ireland executive. :: Reforms to Universal Credit to remove the seven-day waiting period so entitlement starts on the day of the claim and to ensure that any household needing an advance can access a full month's payment within five days of applying. :: National Living Wage to rise in April 2018 by 4.4%, from £7.50 an hour to £7.83. :: Income tax-free personal allowance to rise to £11,850 and higher rate threshold to £46,350 in April 2018, leaving the typical basic rate tax payer £1,075 a year better off compared to 2010.
:: Tobacco duty escalator to continue at inflation plus 2%, with an additional 1% duty on hand rolling tobacco this year. Legislation to increase duty on high-strength low-quality alcohol from 2019, but duties on other ciders, wines, spirits and on beer to be frozen. :: Cancellation of fuel duty rise for both petrol and diesel which had been scheduled for April. :: Additional commitment of £2.8billion to the NHS in England, £350 million to be provided immediately to allow trusts to plan for this winter and £1.6 billion in 2018/19, with the balance in 2019/20. :: Income tax to be applied from April 2019 on digital economy royalties relating to UK sales which are paid to a low-tax jurisdiction, raising about £200 million a year. :: At least £44 billion of capital funding, loans and guarantees over five years to support house-building and deliver 300,000 new homes a year. :: Abolition of stamp duty for all first-time buyer home purchases up to £300,000.